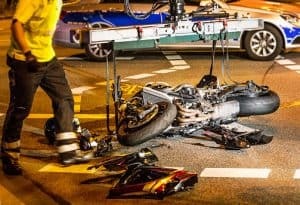 Motorcycle accidents are among the most sinister of vehicular collisions and, oftentimes, motorists are horribly injured. Enduring the trauma and fallout from one of these crashes can result in lost wages and impaired earning capacity, pain and suffering, property damage, and a host of other ills. If you are planning on filing a personal injury suit, evidence supporting your claims is paramount. Motorcycle accidents can be some of the most difficult and complex to litigate. When you retain your Los Angeles personal injury attorney, you should ensure their experience in this type of litigation, and also consider their reputation as trial lawyers. It is important that you retain counsel soon after the accident, and that you are mindful of the two year statute of limitations for personal injury law suits or settlements in California (California Code of Civil Procedure 335.1). Claims against the government, though not as common, have a statute of limitations of six months (California Government Code 911.2). In these cases, it is important to file your claim as soon as possible. Your helmet. This piece of evidence will be important in establishing that you had little to no part in sustaining your head, neck, or face injuries. Evidence of proper safety protocol is paramount to winning your case. Police report. This report will contain witness statements, photographs, and other evidence. A favorable police report goes far in establishing a narrative in your favor. Medical records. Likely the most important piece of evidence you can produce, you should get copies of all the records you can, including doctor’s notes, X-Rays, and paramedic assessments. These records will directly contribute to the calculation of settlement monies. Witnesses. The testimony of an eyewitness is often the lynchpin of a personal injury case. These witnesses are not limited to those the police took statements from at the scene of the accident. Recordings. Surveillance cameras especially are of use for this type of evidence. Gas stations, city-owned property, and private surveillance cameras are just a few of the possibilities for obtaining surveillance video footage. Usually, you can gain access to these recordings by merely explaining your position and asking. If not, your Los Angeles personal injury attorney can subpoena them. Motorcycle accidents can be fatal, near fatal, or can impede your quality of life in many ways. If you are in the Los Angeles area, contact the experienced law firm of Taylor & Ring for a consultation about your recent accident. We can be reached by phone at 310-776-6390 or through our contact form.